Our range of products include sleeping hammocks and chair hammocks. 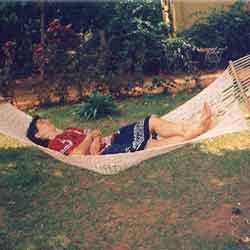 Our esteemed clients can avail from us the finest range of Sleeping Hammocks. 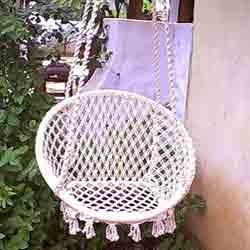 These products are weaved without knots using 100% natural unbleached polyester rope interwoven without knots for. We are known as a reputed Sleeping Hammock Traders in the market. Further, these products are provided with 2 wooden sticks of cedar wood. To cater to the multifarious requirements of the clients, we offer these products in standard size of 3' x 6' and different specifications. With the assistance of our team members, we have been able to bring forth an impeccable range of Chair Hammocks. Manufactured by making use of supreme quality 100% natural unbleached polyester rope interwoven without knots that ensure flexibility. Furthermore, these are provided with 2 wooden sticks of cedar wood. Keeping in mind divergent demands of the customers, we offer these hammocks in multiple colors and sizes. We are known as one of the leading Chair Hammock Sellers.